In December 2015, we were contacted by an offshore oil & gas manufacturer in The Netherlands. They were looking for a large custom transport cover for a huge piece of equipment to protect it during a 12,500 nautical mile journey from Rotterdam in The Netherlands to Okpo in South Korea. At 19m (62′) long x 17m (56′) wide x 20m (66′) high, the module was too large to be completely enclosed within the hold of any transport ship and so for around 52 days at sea it would be exposed to the elements it as it passed down through the North Atlantic and across the Indian Ocean. We demonstrated the shrink wrap encapsulation concept to the customer by travelling to Rotterdam in January 2016 and shrink wrapping a scaffold tower. 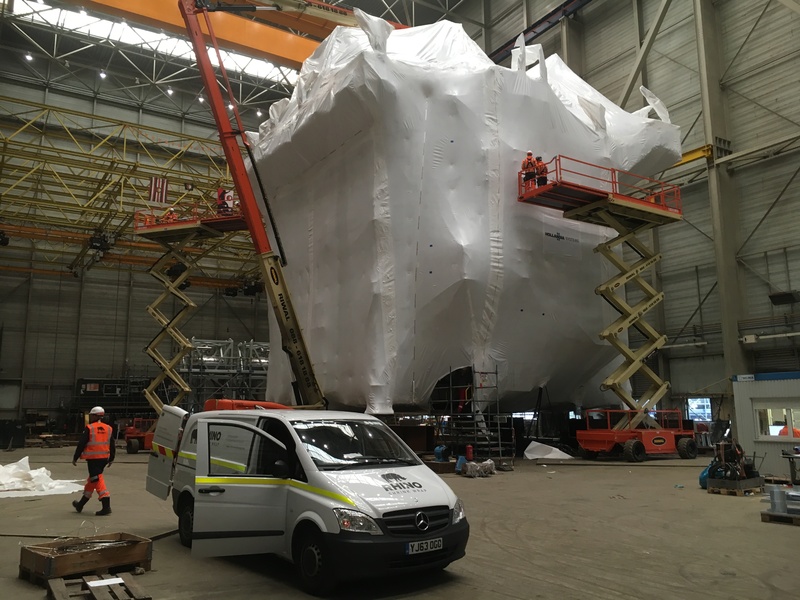 Following this test, Rhino Shrink Wrap were awarded the contract to provide the materials, equipment and labour to completely encapsulate the module on site in The Netherlands in March 2016. How Do We Make Sure This Custom Transport Cover Will Not Blow Off? Our key concern for a large custom transport cover project such as this is to make sure that it will withstand the toughest of weather conditions without flapping and detaching. We start by considering the wind loads that might reasonably be expected. A Force 10 ‘storm force’ wind of 48-55 knots (55-63 mph) will exert a force of 0.77kN/m2 on to the shrink wrap sheeting. If we look at the module in terms of a 6 sided cube, these sides range in size from 340m2 (3660 square feet) to 380m2 (4090 square feet). 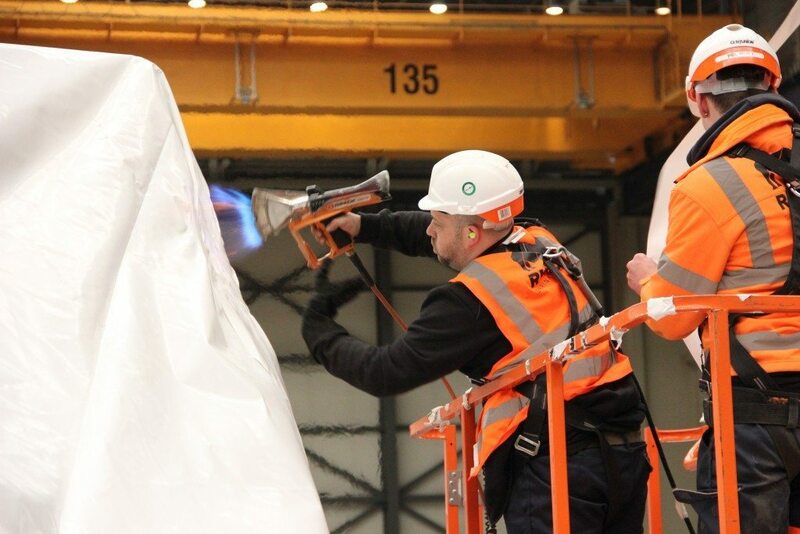 This means the wind load on the shrink wrap sheeting on just a single side of the module would be around 300 kN which is equivalent to 30 ton-force during a Force 10 wind. To mitigate these risks we start off by using our 300 micron (12 mil) flame retardant shrink wrap sheeting. This grade of industrial grade shrink wrap sheeting is often used for the encapsulation of large scaffolding structures and it has been specifically engineered to have a high tensile strength at yield This means that not only will it withstand highland loads but it has the elasticity to ‘rebound’ and stay tight and taught. With low quality shrink wrap grades, it may withstand some initial wind loading but it becomes loose and baggy which then causes it to flap and eventually ‘self destruct’. However, on this module there were areas or ‘voids’ where the sheeting would have minimal support from the structure of the module itself which would put further loadings on the sheeting. To mitigate this risk even further we decided to install a tough plastic mesh around the sides, underneath and over the roof of the module. This mesh was tied back to the main structure of the module and provided support to the shrink wrap sheeting. However, the main benefit of using the mesh is that after we have installed the shrink wrap sheeting and heat shrunk it ‘drum tight’ around the module, we can then install a velcro tie through the shrink wrap sheeting and around the mesh which sits underneath. We installed such ties ever 1 square metre over the entire module and it means that not only is the shrink wrap supported against wind forces which push against it but where strong winds pass across the sheeting and create suction / lift, the sheeting remains firmly fixed in place. 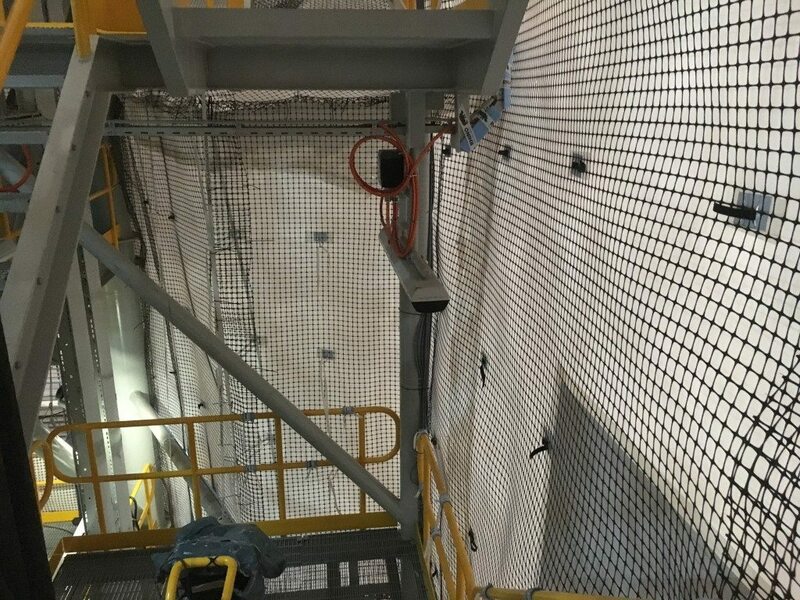 This mesh and shrink wrap technique is fairly time consuming to install and it is certainly not something we would suggest for every situation where a large custom transport cover is required. However, for those situations where ‘failure is not an option’ we have found it to be highly effective. Remember, for an overview of the installation process please also see our ‘Large Custom Transport Cover’ video. 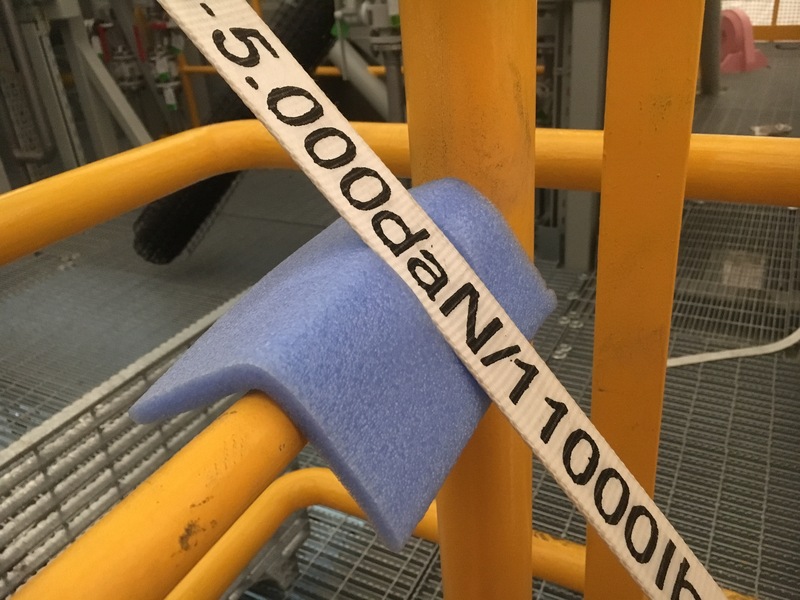 We started by using foam which was cut to size and securely fixed via Rhino Patch Tape to pad sharp edges or surfaces of the module where mesh / sheeting / strapping may contact the module structure. Next, following our customer pre-approved plan, using MEWPS (cherry picker) the roof straps were laid out. Anchor points for strapping were located and padding pre-installed. Once all straps were positioned they were tensioned to produce the correct roof structure and falls to allow rainwater to drain freely. The 4m wide rolls of mesh were unrolled at ground level and cut to the required size using wire snips. Using scissor lifts and cherry pickers, the pre cut sections of mesh were positioned and secured to the module with woven strapping. This was repeated until all 6 faces of module were covered with individual mesh sections. Assisted by MEWPS, the shrink wrap sheeting (Rhino 7m wide x 15m long, 300 micron, flame retardant) was placed around the module in the required position (unfolded). Sheet is then cut from roll to required size. Unfold sheet to required width. Trim sheet to required size where necessary. Individual sheets of shrink wrap were joined / sealed together by overlapping them (30-40cm overlap) and using a heat weld process. Where welds run horizontally, we ensured that the higher sheet of shrink wrap overlapped the lower sheet on the outside of the module in the manner of roof tiles. 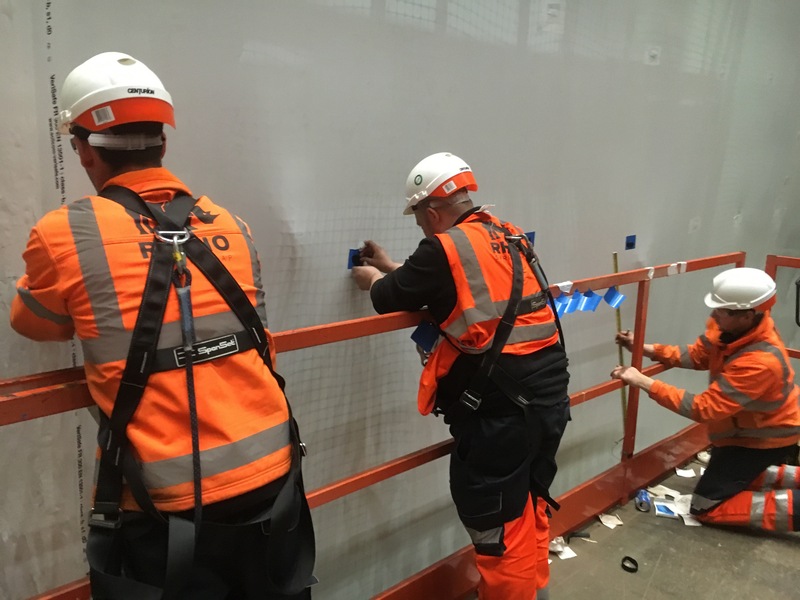 If a good quality shrink wrap sheeting is used, it is not usually required to tape the heat welded joints between sheets but for a project such as this we taped all welds on external / internal faces using Rhino 100mm wide patch tape. Finally we installed a 100mm x 100mm (approx.) reinforcing tape patch every one square metre. We then cut two slits (approx. 50mm long and 40mm apart vertical distance) through reinforced patch and external shrink wrap covering every one square metre. A Velcro tie was installed through the wrap, around one square of mesh (two plastic strips) and back through wrap, and then the Velcro was joined together on the outside. Once all ties were installed, the area was covered with a 100mm x 100mm (approx.) white tape ‘patch’ to create a weather proof seal. The installation of the shrink wrap transport packaging is by definition one of the very last steps on a complex industrial construction project like this. It is much easier to install a transportation cover when the team have exclusive access. However, with a hard deadline approaching such as the sailing date of the transportation vessel, there is the inevitable rush of last minute work and modifications to the module which can sometimes conflict with the needs of the cover installation team. This last minute work could mean our installation team not being able to access a certain parts of the module whilst tests are being carried out or might even be asked to remove parts of the shrink wrap cover to allow equipment to be craned onto the module. Whilst this is frustrating for the installation team, a shrink wrap cover offers much more flexibility in this regard than say a custom tarpaulin cover would. This is because the shrink wrap cover can be cut open and then resealed by welding a patch over the damaged area. We did this in a number of areas and on a number of occaisions. The shrink wrap installation team were able to be very flexible. When faced with the ‘congestion’ of other trades on or around the module during the day, our guys switched to working night shirts for a few days so that they could still make some progress. On this project, the roof proved to be a particular challenge. It was a highly complex part of the module with many vessels, pipes, valves and structural elements at varying heights and positions. We initially considered installing a scaffolding or wooden frame-work to provide a structure to which we could shrink wrap but rejected this idea in favour of a tensioned strapping system which was used both underneath the covering and over the top of the finished shrink wrap cover. This enabled us to create the lowest ‘profile’ roof structure which ran as close as possible to the structure of the module. Working on the roof required use of large cherry pickers, scissor lifts and a man basket which was hung from the overhead factory crane. 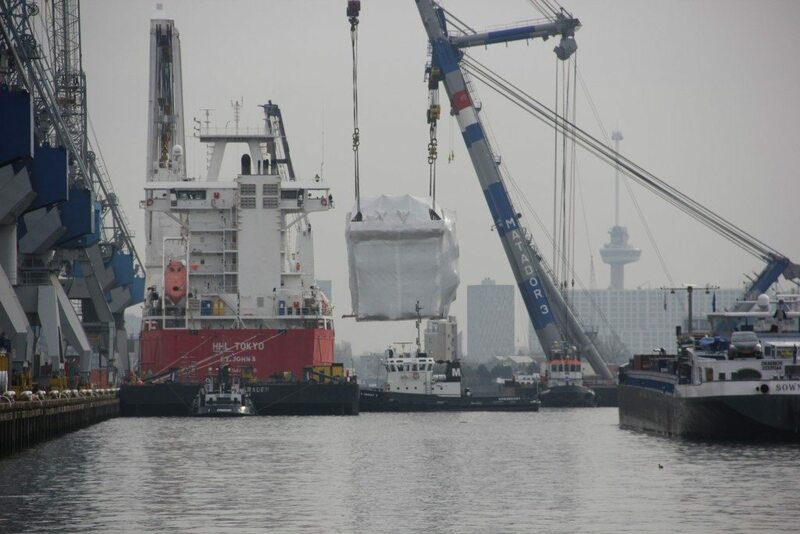 Lifting module with large custom transport cover on to transport vessel for 12,500 mile voyage from Rotterdam to South Korea.